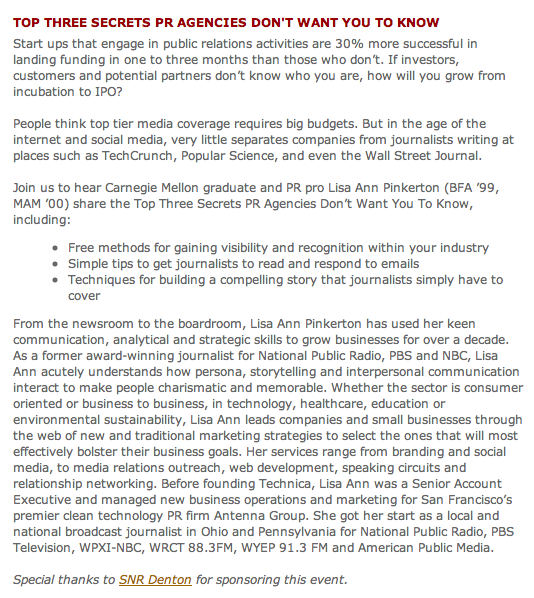 This week went to volunteer for a CMU – Bay area alumni event, a talk on DIY PR by Lisa Ann Pinkerton. The initial half hour was networking, I met many interesting alumni working in the bay area for sometime and now working on their startup idea in spare time. I was not sure about what to expect in a talk on PR. A nice PR can certainly help to build the buzz surrounding the product or the company. I am usually of that opinion that a nice product should speak for itself, but I think in this age of constant information its possible that your product might get lost in the noise, so its equally important that PR be of same quality as your product. Also as in the book Blink, Malcolm Gladwell convinces that people just take a few seconds to make a decision, its important that we make a good first impression and thats where PR comes in. Editorial calendars, are the ones where the publishers let the world know the topics they would be covering in upcoming edition. This helps advertisers know in advance which edition to target and also interested parties can contact journalist to cover a particular story. Best time to send an email to a journalist is usually between Thursday – Monday during after work hours where they are more likely to reply to a mail! So in essence like in any other field, building successful PR is about building mutually beneficial connections and leveraging them when required.